Buy this book with Java Web Services Architecture (The Morgan Kaufman... by James McGovern, et al today! from the Foreword by Simon Phipps, Chief Technology Evangelist, Sun Microsystems, Inc.
Average Customer Review: based on 39 reviews. I am new to web services, and purchased this book based on the good reviews it has received. I was quite disappointed in this book, which is both repetitive, drawn-out and shallow in its coverage of web services. 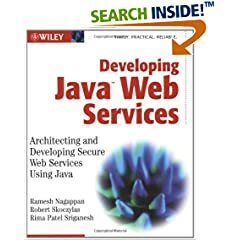 Although the book covers most aspects of web service development using JWSDP, as a result almost nothing is covered in great detail, and the book's 700+ pages ultimately provide a dreary drawn-out overview of web services better found elsewhere. I am now using Apache Axis to create web services, trying to figure out how to create stateful web services. Axis is barely covered by the book, and I cannot find any mention of how to implement stateful web services. As a result, the book stays on the shelf collecting dust, while I google around the Internet for answers. The cover of this book says, "Timely. Practical. Reliable." and that is a good description of the book. It covers the current state of Java APIs for web services, it gives plenty of well thought out examples, and it provides enough information to actually make the alphabet soup of acronyms understandable. The book starts with an introduction to web services. The next section covers web services architecture and the standard technologies of SOAP, WSDL, and UDDI. Interoperability with non-Java applications is demonstrated with a .NET example. The book is written by three Sun employees so it does tend to be a bit Sun-centric as the next sections shows. The Java Web Services Developers Pack (JWSDP) is given plenty of coverage. JAXP, JAXB, JAXM, JAX-RPC, JAXR, may be just acronyms when you get this book but after reading the six chapters covering the JWSDP they will be technologies that you understand. A case study wraps up the six chapters putting the whole thing together. The book ends with a chapter on security and a look at Sun ONE. The book is full of examples demonstrating how to use each of these technologies. When you read a line such as, "The real fun is understanding how the EncryptDecrypt class works," you know you are dealing with authors who love code. For developing Java web services you will be hard pressed to find a better book than this one. I bought this, hoping to be able to use it on a web services project I'm doing. I find it's completely out of date. Both Sun's JWSDP and Apache Axis have moved on since this was written, and you'll get better information from their websites than you'll get from this book. Don't be fooled from the good reviews this book has gotten. this book is the WRONG choice for anyone willing to LEARN about web services in Java. It is merely a boring, dry, wordy, repetive, confusing (and confused) compilation of web-services related topics. The authours might be good programmers maybe, but as they are clearly very poor technical authors.. their writing style is boring, excessively wordy and abstruse. Not clear and concise enough to be useful as a reference and absolutely terrible as a tutorial. The preface tells how the idea of writing this book came form one of the authors who, sitting in a pub with the others was the the only one who wasn't drinking. I have some advice for this guy: start drinking. Better read the specifications than this book. It is merely a compilation. No attempt has been made to illustrate a single concept. Some times, I wonder whether the authors understood something at all or just wrote the book out of passion to write a book, since there is NO value addition to your understanding. Not worth even a buck. This book is okay as a starting-point in learning Java web services. It attempts to cover a wide range of topics but fails to expand on some subtleties crucial to the understanding of these topics. One obvious example of this is the distinction between document-literal binding style and document-based web services. The book touchs on both concepts but stops right there without any explanations on how these concepts are related or not related, what are the implications of choosing a binding-style from the perspective of a web services developer or an admin, whether the choice of a binding-style determines the programming model, the API set, etc. The authors tend to be loose from time to time with their use of terminologies and concepts. Admittedly, part of this is due to the state of the art of web services itself. That being said, some of the comments in the book are quite confusing and misleading. One example is found on page 454 of the book "JAX-RPC is also a best-fit solution over JAXM ... where high performance ... are defined as the key requirements." This is simply contrary to the common wisdom that loosely-coupled messaging applications usually out-perform their tightly-coupled RPC style counterparts when "performance" is defined as the system throughput. RPC style apps may offer a more predictable response time at the cost of inferior throughput. However, this point was never expanded on with any further information. Similar comments can be found throughout the book. The writing style of the book is quite verbose and repetitive. Quite often the same point can be found twice or more in one paragraph. With its shortcomings, the book is still a decent introduction to web services. However, I would recommend supplementing with other online sources. There are many wonderful technical articals on SUN's blueprint site, IBM and Oracle's developer communities. A list by Prasad Reddy "Prasad"